News came down early Tuesday afternoon that the Orlando Magic have agreed to send free agent to be Serge Ibaka to the Toronto Raptors in exchange for scoring wing Terrance Ross and the Raptors 2017 first round pick, as first reported by The Vertical. This deal makes absolute perfect sense for both franchises and their needs and where they are headed the rest of the 2017 season and into the 2017 off-season. With Mario Hezonja’s slow development and the Magic’s dire need of wing talent, scoring and pure shooting ability, Ross fits in perfectly with what they need to improve their currently putrrid offense and create more spacing and provide another player who can create his own shot. It also clears up some of the bizarre logjam that the Magic had in their front court after a head-scratching off-season in which they acquired Ibaka, Bismack Biyombo and Jeff Green to join Aaron Gordon and Nikola Vucevic. 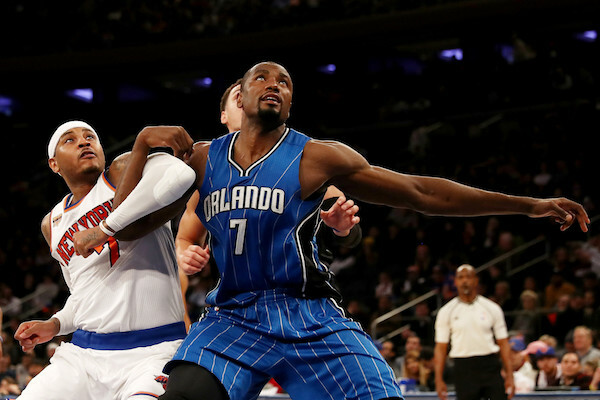 Ibaka is a free agent to be and he likely wouldn’t have re-signed with Orlando. It wouldn’t have been a smart move for them to give him big money anyway, now they can actually allow Aaron Gordon to develop and have a much larger role. The Raptors meanwhile want to hang on to any shred of contention in the east that they can muster, especially with the new injury to Kevin Love. Dealing a player like Ross who basically is a poor man’s version of DeMar DeRozan with less ability to get to the rim and a little better three-point shot, and a pick in the 20s of the first round, is well worth filling a dire need for a rim protector who can also provide some offensive capabilities and spread the floor for Kyle Lowry and DeMar DeRozan to operate. They also have the talent and situation to encourage Ibaka to re-sign with them this off-season. This is a great move for both teams and will help each franchise moving forward.